Four times a year we are treated to a new set of Utica Shale production data out of the Ohio DNR. With each report we gain more insight into a number of things. In this post I will look a gas production by county. Immediately what stands out is that the lower producing counties have mostly dropped in natural gas production while the top six higher producing counties have all gained in production from quarter to quarter. Minus the one well in Coshocton county, more marginal counties are all in a decline. And while the number of producing wells is similar from quarter to quarter in these more marginal counties, inevitable decline rates will continue to reflect lower production if no new wells are drilled in the counties. 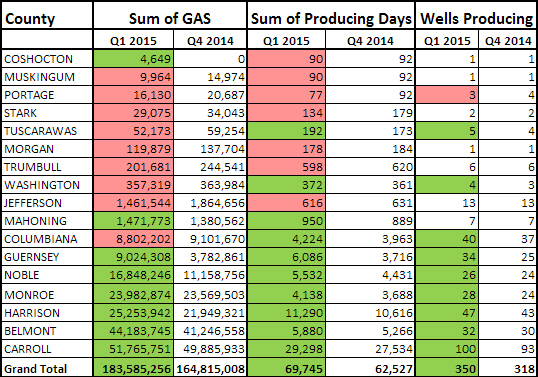 In addition, producing days and wells producing are up, more of an indication that, though slowing somewhat recently, more wells are coming online in the most prolific gas producing counties. On the plus side, Guernsey and Noble counties showed the largest increases in natural gas production quarter to quarter, also reflected in increased numbers of wells brought into production. Another observation to be made is that Belmont and Monroe counties are bringing in relatively higher natural gas production per well as demonstrated by sum of producing days compared to others. Indications are that wells drilled in these counties are relatively more profitable, though that would depend on how early the respective wells are in their production curve relative to wells in other counties. It is no surprise then, according to Ohio DNR permit activity, that Belmont and Monroe counties lead in wells classified as drilling in May 2015. Disclaimer & Caution: While some care was taken to accurately reflect numbers provided by the Ohio DNR, the site owner takes no responsibility for any errors.